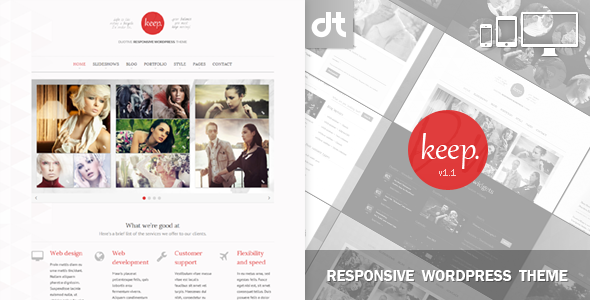 Duotive Keep for WordPress Created by duotive. This templates have specific characteristics, namely: Customizable, unlimited Frontpage layouts with individual . You can use this Duotive Keep for WordPress on WordPress category for clean, custom slideshows, customizable, duotive, high quality, localization ready, mobile friendly, premium, professional, ready fast, responsive, retina ready, seo friendly, translatable, wordpress theme and another uses. “Without sidebar — Three columns”. Pricing packages code generator with user-friendly interface. Content holders: Box, Message — Note, Message — Success, Message — Error, Message — Info, Message — Simple box, Important paragraph, Quote — Full width, Quote — Left aligned, Quote — Right aligned, Highlighted text, Icon, Dropcap. Social media icons: Blogger, Delicious, DeviantArt, Digg, Dribbble, Dropbox, Facebook, Flickr, Google+, Instagram, LinkedIn, Pintrest, RSS, Skype, Soundcloud, Stumbleupon, Twitter, Vimeo, WordPress, Yahoo, Youtube. Localization user-friendly interface. All the strings used by the theme can be changed here. Also, the ability to use *.mo and *.po files is integrated within the Duotive Admin Panel. Complete theme Documentation with step-by-step instructions for all the theme’s features. Friendly for those with less WordPress experience. All the images displayed on the demo website are for illustrative purposes only and will not be part of the design/template meant for sale. Fixed: Problem with upload button on the frontpage intro page. Fixed: Problem with the upload button in the duotive image widget. Added: Toolbar is shown when user scrolls to the bottom of the page. Fixed: Loading behavior for the website’s Toolbar. Fixed: Duotive Complex Slideshow stopped working when all options were turned off. Fixed: Duotive Admin Panel – issue with the misaligned of long slide URLs. Removed a testing alert in the image widget. Removed the live preview option from the theme customizer, becuse it overwrites the theme’s admin panel selection and it does have a work around this. Added/fixed the project with sidebar not working. Fixed the language switcher not working with permalinks activated. Added translation for the mobile menu. Fixed the missing links for the list related projects. Remove the upload button for the image widget and replaced it with a simple text input. This is caused by the fact that the upload button was created using a hack, wordpress not supporting an upload button in that area, and the method we used does not work with wordpress 3.8 update. Fixed: Problem with the slider and IE. Fixed: Problem with shortcodes and wordpress 3.9 update. Note: The shortcode buttons are there, but you have to press the “Toolbar toggle” button on the visual editor if you do not see them. Fixed: PHP Warning with MYSQL list table.